Even Buck and Mano Know it's Late! When Buck and Mano think it's late - it's really late! We'll do our best to make room for you, but no promises, get your registration in at WWW.THEHIGHCHAPARRALREUNION.COM. Where is Victoria’s magic closet when you need it? Wouldn’t it be great if, inside the Cannon ranch house, there still existed Victoria’s magic closet? You remember; the never-seen miraculous dispenser of breathtaking outfits in a never –ending supply, that fit each person who needed a little boost in the wardrobe department like a glove (even if they were a totally different size than Victoria?) Of course we’d have to transport it (magically) from the ranch to the Casino Del Sol, our ranch away from home during the reunion. Each morning we could take a turn to dash inside and come out looking like Victoria had dressed us. Except for the corset part – I draw the line at a corset. I’ll try the turquoise peasant blouse and white skirt Victoria wore several times (like in The Little Thieves), or maybe this light lavender dress with the simple ribbon trim she wore while looking worried about the fate of Sam in Follow Your Heart. Maybe for the Friday night sponsor’s dinner I’ll step into her white lace blouse and black velvet skirt, just so I can wear the pearls (before they broke in Once on a Day in Spring). No way I could get my hair done up like that though. Maybe the closet comes with a magic hairdresser? 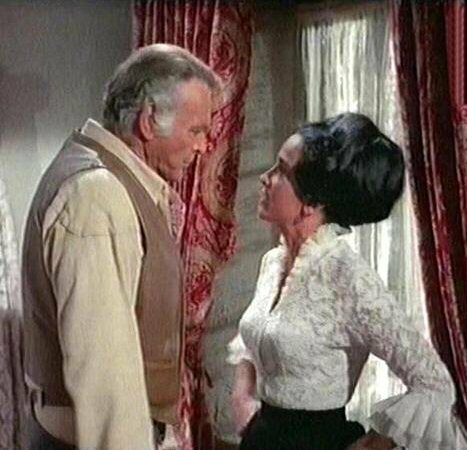 While much of the magic of The High Chaparral is going to come true for us during the reunion (just wait until you take your first trip through the gate and see the house…the Cannon ranch house, just as if John and Victoria are going to appear in the front door any second), none of us will hold our breath about the magic closet. Which means…deciding what to wear. If you are flying in to Tucson, you have one suitcase. One chance to make the first impression on Henry or Don or Rudy. What do you pack for three days (and one night, if you are attending the special White Stallion Dinner on Thursday) so Victoria will be proud? If you haven’t attended a High Chaparral Reunion before, you might wonder how everyone else is going to dress. And here is the answer: every possible way. You’ll see jeans, shorts, dresses, t-shirts (many with an HC logo), silk blouses, cowboy boots, flip-flops, and probably the occasional ungarbed foot (not recommended). Friday night at the cocktail party and sponsors dinner is when many of the ladies give Mrs. Cannon a run for her money. You’ll see floor length dresses, short dresses, fancy rodeo-type shirts, bolero jackets as well as the same t-shirts and jeans you saw earlier in the day. In short, anything goes. On any day of the reunion, everyone dresses how they feel like it. That being said, there is a fan who dressed in a traditional Spanish dress, complete with beautiful headdress that is still remembered. I know she sat with Henry at dinner and he hasn’t forgotten her, many years later. There is a male fan who arrived on Friday in complete authentic Western wear – the gambler type of outfit, with brocade vest, swallowtail coat and the perfect hat. He was the one the news crew from the local TV station pulled on camera for his thoughts about High Chaparral. In short, it’s also all right if you want to make at statement. How many other events will you attend where your fellow-attendees will absolutely accept your need to dress in a magical way? And that first impression you’ll make on Henry, Don and Rudy? They’ll get that from your enthusiasm, your smile, your easy way with a conversation. Because you can bet that our Western heroes will have left their pearls at home. That's Cameron Mitchell in full costume catching a round of his favorite pastime - GOLF! "I see that the you have a picture of the record cover of the swedish tribute song ”Manolito”, sung by Lill-Babs (Barbro Svensson), on thehighchaparral.com. 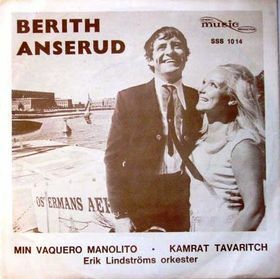 There was another “Manolito” 45 rpm in Sweden in the 60's, “Min Vaquero Manolito”, sung by Berith Anserud, released on the Hendrix Music label, 1969. The song was written by Erik Lindstrom and Borje Carlsson. But while Lill-Babs song was very popular, often played in radio, I didn´t even know about Anseruds song before I found it on an internet auction site." J-O sent along some photos of “Fangar hos apacherna” (Apache Way) by Steve Frazee, and the paperback books FARANS STAD (Town in Fear), DÖDEN I TUCSON (Hell and High Water), and APACHERNAS DAL (Man of Honor). See what we're talking about on Facebook? highchaparralreunion has over 1600 fans sharing photos, videos and memories. 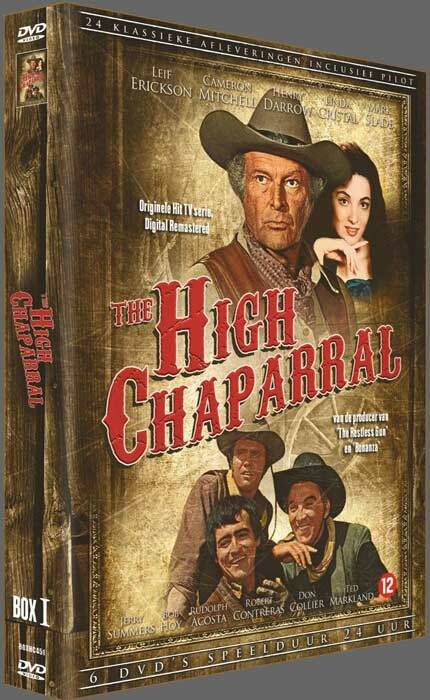 Remember if you want your own copy of The High Chaparral, you can order from The High Chaparral Reunion. 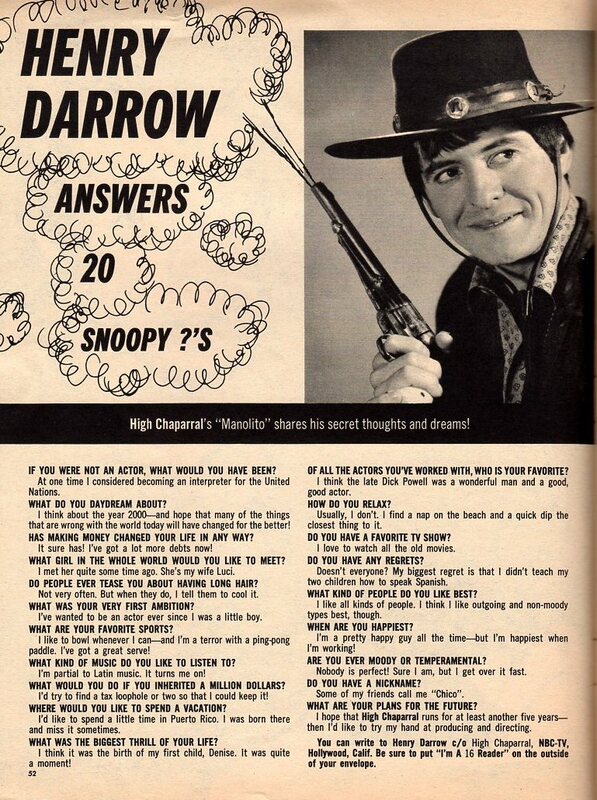 Though Darrow rates the No. 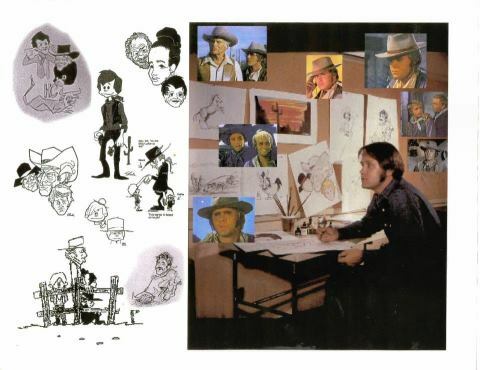 5 spot on “High Chaparral’s” casting credits, the could easily turn into the western’s ace drawing card, playing Manolito Montoya, the roguish Mexican cowhand employed by Big John Cannon. The series is seen Sunday nights over NBC-TV. 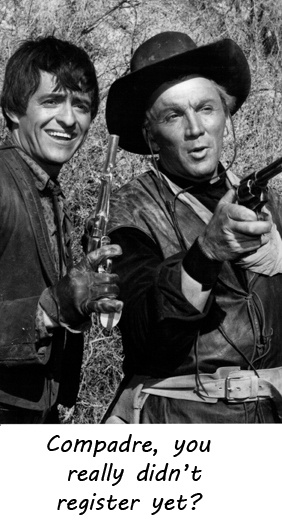 Henry simply stole most of the thunder in the “High Chaparral’s two-hour pilot with his lively Latin ways. As Manolito, Darrow is no sleepy, brooding Mexican stereotype allowed a few grunts and the customary “Si, Senor.” Nor does he play the proud, angry Latin in love with his looks, steaming about in immaculate black. Instead, Manolito, son of a Spanish hidalgo, appears to be a young man with the sap running high. He won’t work for his father because he doesn’t want to be encumbered with ranch responsibilities, so he goes where the action is – on the Cannon ranch. A rebel, but not a surly, sulking one, Manolito should be simpatico with the kids, if they can stay up that late on Sunday nights, and he’s obviously going to wow the ladies. Right now there’s only one small matter that could hold Darrow’s popularity back – small parts. Since 18 episodes were already finished before the season premiere, there’s no way Henry’s role can be enlarged to give the unknown more breathing room. Henry the sleeper must be patient and watch the big scenes go to leads Leif Erickson, Cameron Mitchell, Linda Cristal. Still, High Chaparral has become something of a landmark already in bettering the Spanish image of the screen. 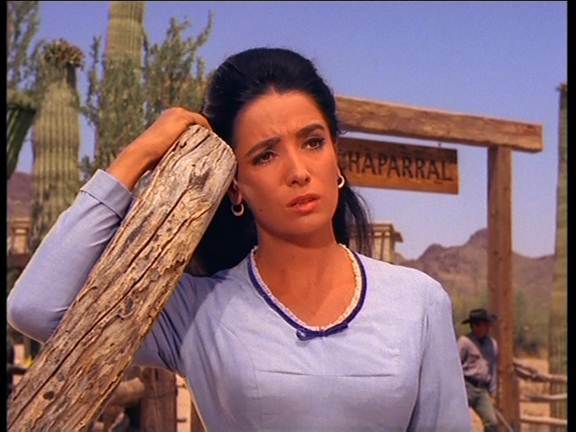 Out of a cast of 11 – four are Latin, beginning with Argentina’s Linda Cristal; Puerto Rico’s Darrow, whose real name is Delgado; Mexico’s Rudolfo Acosta, and a Spanish Basque working a an Indian. Producer Dortort’s below the border emphasis is also an economic one, with big foreign sales on the line before the season began. Having a limited audience, the producer doesn’t have to do as well by the Indians, but he intends to give their sullied Hollywood image a thorough face-lifting. But back to Puerto Rico’s Henry Delgado who came to Hollywood in 1956 on a government scholarship to the Pasadena Playhouse. Henry had a choice between study at Yale University, New York City’s Neighborhood Playhouse and Southern California. Since the playhouse was only 20 miles from Hollywood, Henry went west and never regretted it. After completing his schooling, Delgado worked in little theaters around town, hitting casting offices in the daytime, trying to become established as a Latin stereotype. “The first step out here is to be typed as something,” he claims, and he wore out a lot of shoe leather in the process. Step No. 2 is to become unstereotyped so you are available for all kinds of roles, and Henry figured this was possible in little-theater work. He finally broke the ice two years ago playing a lively Spaniard, essentially the same type as Manolito, in “The Wonderful Ice Cream Suit.” Producer David Dortort caught a performance and was impressed. Out of this play, Henry earned a return visit to the Pasadena Playhouse for a year of repertory and a movie offer. After the year was up, Henry sat down with his agent and decided to change his name – junk the Puerto Rican moniker in an effort to step up in the trade. Henry Darrow returned to the Hollywood casting offices minus glasses and became a new face, thanks for a new last name. Familiar casting people didn’t recognize him, which sounds incredible but is true. One bright man offered him a job as a German, then took a closer look and asked if he could play a Spaniard. Completing his rounds, Darrow walked into the offices of producer Dortort, only to discover that David was going crazy trying to locate an actor by the name of Delgado who had disappeared into the mist. When the room cleared Henry had the role of Manolito, and at last his scholarship was about to pay off. Should Henry change his name back to Delgado, which is more in keeping with his series character, or stick with the simple English one to please casting people? Thinking of the long run, Henry is going to stay with Darrow. In crazy Hollywood, it’s safer. As for the part of Manolito, will Latin’s accept the character as an honest effort to erase all the old Hollywood caricatures? Henry believes his people will be pleased in the long haul. Skepticism is only natural in the beginning, and for this reason the biggest TV buying country in Latin American, Mexico, will wait before putting money down on The High Chaparral.